More than 1 in 12 Americans are affected by asthma, a disorder characterized by an overactive immune response to normally harmless substances such as pollen or mold. Scientists had previously discovered that an overabundance of immune cells that help defend the body against parasites and infection, called eosinophils, were implicated in certain forms of asthma, as well as in allergic reactions. But little was known about how eosinophils develop and survive. In their study, published July 6 in Nature Immunology, the investigators discovered that a signaling pathway, formed by two proteins that help cells survive stressful conditions, also plays a critical role in eosinophil development. 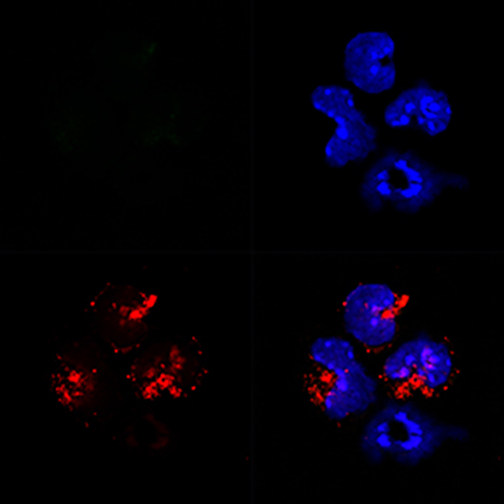 When the investigators altered the function of either of those proteins, the eosinophils, but not other cell types, underwent excess stress and were completely wiped out, suggesting that this pathway could serve as a new therapeutic target for patients who respond poorly to current asthma therapies. Eosinophils belong to a group of cells called granulocytes, which develop in the bone marrow before migrating into blood. During early stages of development, these cells produce a large number of proteins that are critical for survival, as well as toxic proteins that are later released in response to an immune trigger, such as bacteria or viruses. Intense bursts of protein production during normal biological processes put strain on a cell structure called the endoplasmic reticulum, which plays a crucial role in protein synthesis and transport. If the ER is overwhelmed by such strain, the cell enters a state known as ER stress. This image illustrates XBP1-deficient bone marrow-derived eosinophils without amyloid structures. The nucleus is colored in blue and specific eosinophil proteins are stained red. In response to ER stress, a protein called IRE1α helps to generate a highly active form of a second protein called XBP1, which in turn regulates the activity of various genes involved in the cell stress response. This signaling pathway reduces ER stress and prevents cell death by enhancing the ER’s protein synthesis capacity while reducing overall protein production. 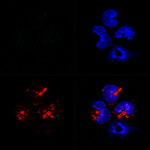 “Because XBP1 supports the survival of certain mature cell types that make a lot of protein throughout their lives, we suspected that XBP1 might also help cells like eosinophils cope with intense bursts of protein production during development,” said senior author Dr. Laurie H. Glimcher, the Stephen and Suzanne Weiss Dean of Weill Cornell Medical College. In support of this idea, the research team found that the IRE1α/XBP1 pathway became increasingly active in differentiating eosinophils as they produced more and more proteins during progressive developmental stages. Moreover, genetically modified mice that were deficient in XBP1 completely lacked eosinophils in the bone marrow, spleen and blood, while other granulocytes were unaffected. 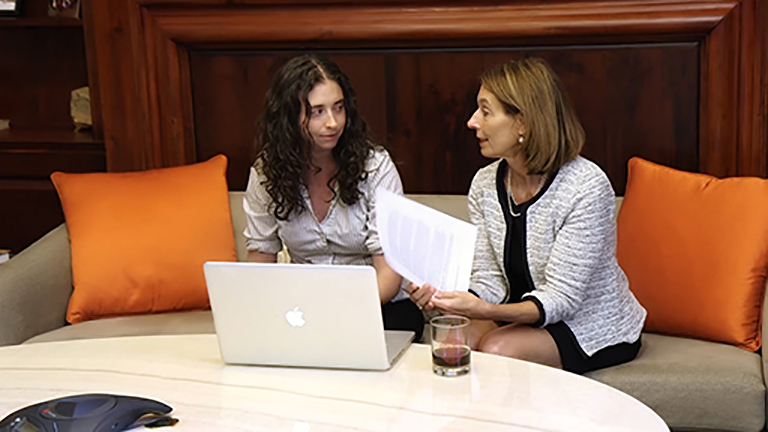 Dr. Sarah Bettigole, left, and Dr. Laurie H. Glimcher plan their paper on eosinophil development, a process highlighted in the first episode of the Inside Medicine at Weill Cornell video series. The episode explored the relationship between Dr. Bettigole, then a doctoral student, and her mentor, Dr. Glimcher. The loss of XBP1 in eosinophils also altered the activity of genes that are critical for the ER stress response, leading to the accumulation of incorrectly processed proteins, substantial ER swelling and severe granule dysfunction. Without XBP1, the researchers discovered that developing eosinophils underwent too much stress. This stalled their differentiation by blocking a molecule called GATA1, which ensures that young eosinophils finish maturing into adult eosinophils. The researchers found that too much stress and not enough GATA1 eventually killed the eosinophils. Taken together, the findings suggest that ER health is crucial for eosinophil development and survival, highlighting the IRE1α/XBP1 pathway as a potential therapeutic target in a wide variety of eosinophil-mediated diseases. The investigators are currently testing whether experimental XBP1 or IRE1α inhibitors can be effective treatments for asthma and eosinophil leukemia.